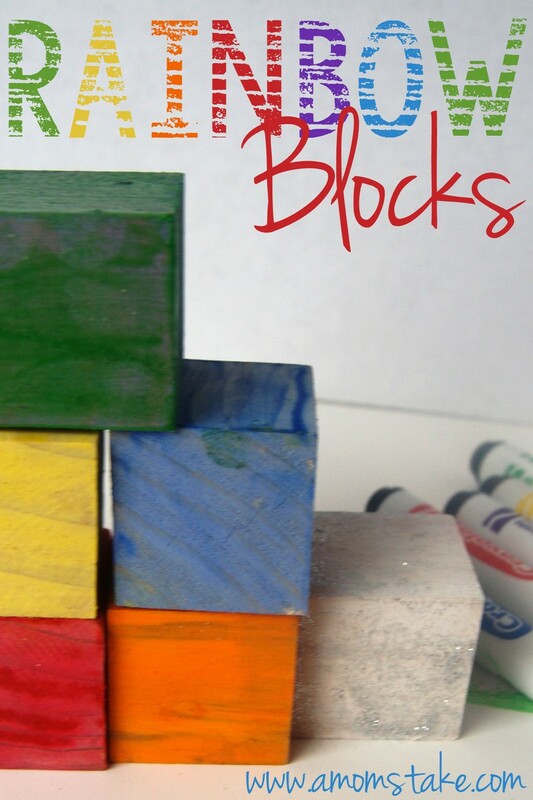 These easy to make DIY Rainbow blocks can be used in so many ways with your little ones. Simple play with blocks is a great way to develop fine motor skills, hand eye coordination, and even early math skills including color recognition, matching and shape identification. You can go darker, or use any shade of color you like, I wanted the look of water color, but a little more intense so that the wood grain would still show through, so I just watered down some acrylic craft paint. For St. Patrick’s Day don’t forget to add some gold coins in a pail, and a shamrock or two for a little dramatic roll play. Paint each side a different shade of a particular color like a paint chip- to help little ones identify that even different shades are still considered the same color. Paint 2 sets of the colored blocks for a matching game. See who can stack the most blocks without tumbling the tower over. Call out colors and have your little one race to grab the corresponding block. Play a game of show me “Can you show me which block is the color of the sky?” or ” Show me the yellow block”-to teach or reinforce colors. Challenge your child to stack the blocks using tongs – great for hand eye coordination. Point to the blocks as you count them- one to one correspondence is an important beginning math skill for your toddler to learn. For a little bit older children, place the blocks in front of them, have them cover their eyes(or leave the room) remove one block and have them guess which color is missing. paper to cover your surface. Add a few drops of water, stir, you want it slightly watery. 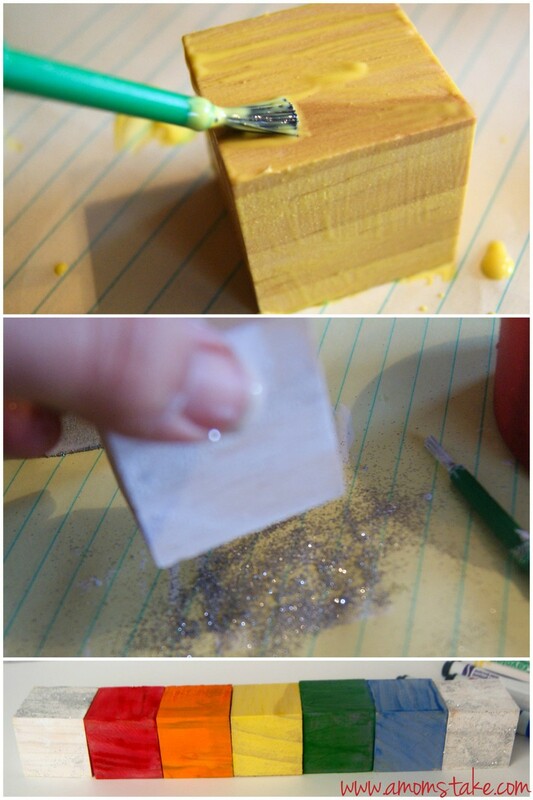 Paint each block- to really show the wood grain wipe off excess paint with a paper towel right away after painting. Allow color blocks to dry completely. For the “Clouds” paint with watered down white paint, while still wet dip in glitter, allow to dry. To make your block colors last longer spray with 2-3 coats of clear coat to protect. I wanted mine to feel as natural as possible so I left off the top coat. In the end, your child can make their own rainbow for St. Patrick’s day, complete with sparkly cloud blocks! What color blocks would you make?